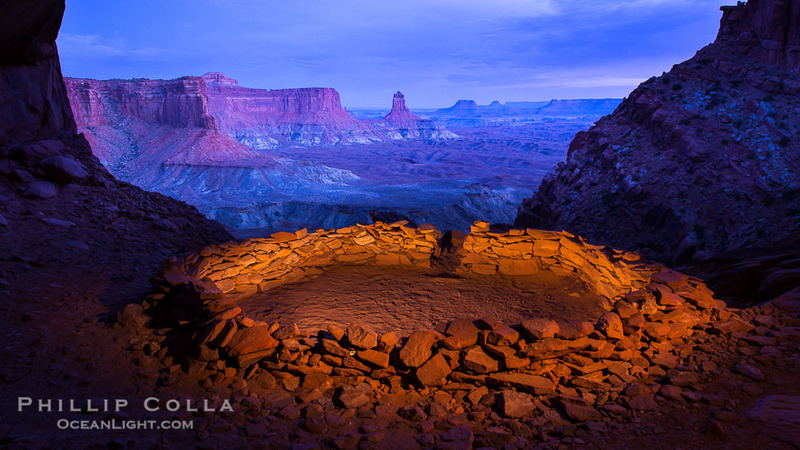 One afternoon in Canyonlands National Park I came up with an ambitious plan: to hike to False Kiva on the edge of the Island in the Sky mesa, photograph the dusk and early evening there, hike out and then shoot Mesa Arch immediately thereafter. I had not originally planned to see False Kiva but decided to give it a try, and treated it as a speedy hike workout. Although I had not been to False Kiva before, the hike turned out to be much easier than I thought it would be and a short while after leaving my car I was relaxing, alone, in the cool shade of the alcove with a spectacular view of the dramatic river-carved Canyonlands expanse far below. You know that hollow sound, almost the echo of an echo, that you hear when on the edge of precipice? That is the sound one hears while at False Kiva. Occasionally a raptor would keen or a bird would glide by and I could hear the rush of the air over its wings. Otherwise, there was no sound but what I made. It was quite moving being there, doing nothing but watching the light change, listening and thinking. The sunset itself was unremarkable, but as dusk passed and evening came on I was able to match the light of my flashlight with that of the dimming sky and painted the ring of rocks for which False Kiva is famous to produce this image. The scene has a great deal of red and magenta in it, the actual hue of the fading dusk. In truth I reduced the saturation a little since it seemed so strong to my eye, but that happens sometimes when shooting in the deepest, most richly colored twilight about 45 minutes after sunset. I was working in what seemed to be pitch dark when I shot this, and the great sensitivity of my camera allowed me to pull out color and detail. Like this image? Please see my website devoted to my full collection of Landscape Astrophotography images. Thanks for looking, and cheers!